We will be sharing our research and practices through a workshop for movers and musicians and a performance on Saturday 21st of July in the URBAN festival in the Kreativquartier. Experience and discover a catastroflixic blend of contemporary dance and music! 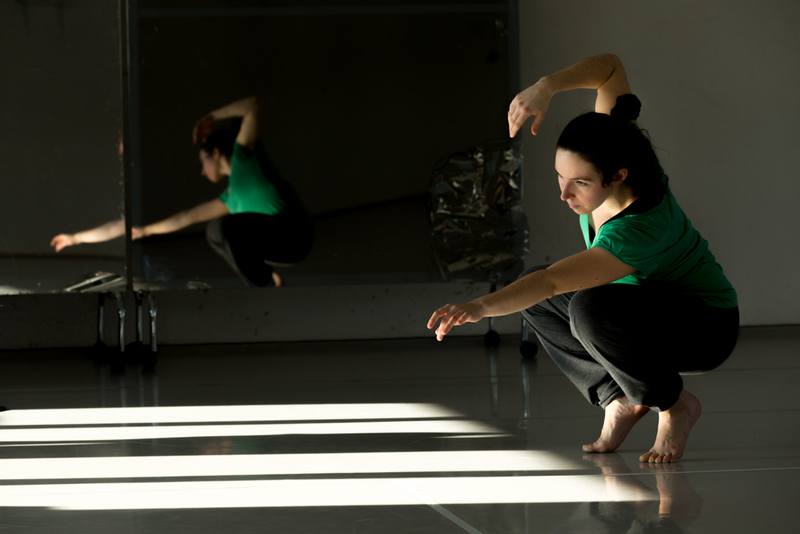 A dance and music improvisation workshops based on contemporary worlds. Saturday 21st of July, from 4 to 6pm. Open to all : movers, dancers, sounders, musicians of all levels and ability. The Catastroflux collective invites movers and sounders to join them in an improvisation workshop exploring worlds they created for their piece “Absurd Journey”. Floriane Dardard will lead musicians into musical landscapes while Lucile Belliveau facilitates a corporal exploration of situations and emotional states. We will use the power of imagination to free ourselves and find new ways of playing instruments and of moving. We will be together in the present and rejoice in this opportunity for expression, letting go and togetherness. An atmospheric and immersive contemporary performance exploring absurdity and harmony through dance and music. Saturday 21st of June, at 8pm. 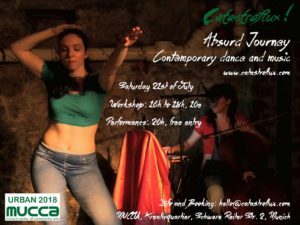 In “Absurd Journey”, we explore though dance and music our perception of the world as an absurd space, which does not follow rational or logical rules. We go on an external journey through the world and an internal journey through ourselves. We travel from one place to the same place, yet our awareness is increased. At the end of the journey, the absurdity is still there but instead of letting it overwhelm us our better self-awareness allows us to find meaning and to create human connections with ourselves and with others. Two performers create experimental music and dance in the moment, and guide you through different worlds of their own. We are showing Absurd Journey for the first time in France in Paris, at théâtre associatif de l’Ogresse. Meet us at 19h on Sunday, June 10th ! We will partake in the joy and peace of dhrupad combined with danse in “The inner peace generator”, and then take a deep plunge into a chaotic journey. Le collectif Catastroflux présente un diptyque catastroflixique ! Le dimanche 10 juin à 19h. Entrée libre. A l’Ogresse, 4 rue des Prairies, 75020 Paris. Pour la première fois à Paris le collectif Catastroflux se réunit pour présenter un spectacle sensible, humain et capilotractant. En première partie, laissez vous emporter par “Le générateur de paix intérieure”. 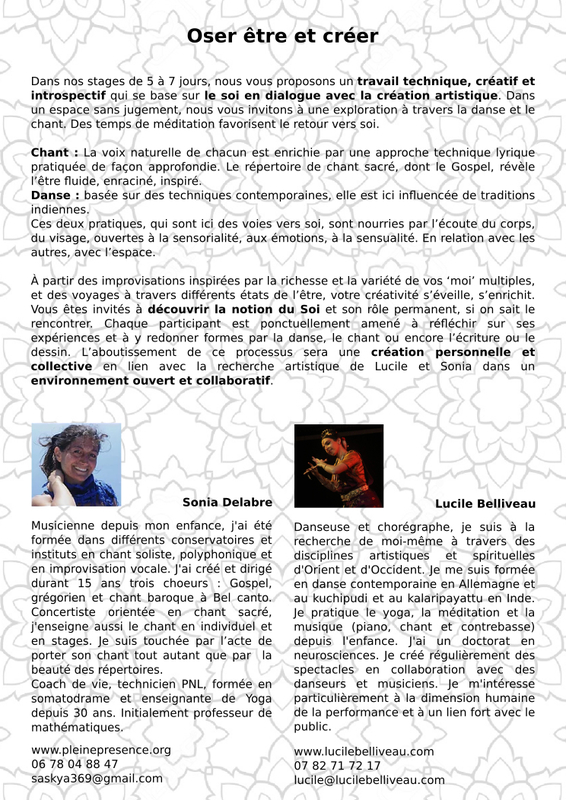 Né d’une collaboration entre Jérôme Cormier, chanteur de dhrupad, et Lucile Belliveau, danseuse contemporaine, ce spectacle vous invite à explorer votre monde intérieur. Le dhrupad est la forme musicale classique la plus ancienne de l’Inde à être encore pratiquée. Elle est empreinte d’une forte spiritualité et touche les âmes et les corps par sa force tranquille et sa clarté. Le corps de la danseuse se laisse modeler par ce chant, et s’approche d’une expression humaine du soi profond. Les deux artistes vous proposent ainsi une méditation du son et du mouvement dans laquelle chacun est invité à se plonger. Après avoir voyagé en Allemagne et en Inde, le spectacle “Absurd Journey” (Voyage Absurde) est présentée pour la première fois en France par Floriane Dardard et Lucile Belliveau. Mêlant danse et musique contemporaine, il propose un voyage au cœur d’un monde changeant et absurde. Les deux interprètes voyagent à l’intérieur et à l’extérieur d’elles-mêmes, créant la musique et la danse ensemble dans l’instant présent. Elles explorent avec vous la possibilité de vivre dans un monde chaotique grâce à une connaissance de soi, qui permet peut-être le bonheur en pleine conscience. Elles voyagent au travers de multiples mondes, proposent des atmosphères tour à tour légères et empoisonnantes, jusqu’à trouver, enfin, un état d’harmonie. N’hésitez pas à profiter de la délicieuse cuisine associative et locale de l’ogresse avant ou après le spectacle, et à vous y désaltérer amplement. Les artistes vous rejoindront après le spectacle. We did it ! 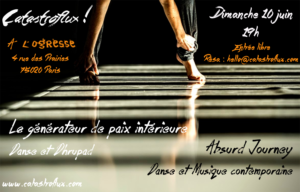 Thanks to a wonderful team, we performed a new work called “A l’heure ou scintille la tuile”, or “The time when the tile is shining” in Frazé, France on May 19th. From the smiles we saw, it was a great experience for everyone. Beautiful time to spend together soon! I am organizing workshops called ‘Dare to be and create’ with my colleague Sonia Delabre. Come to explore dancing, singing, the Self and creative processes with us! There will be a workshop in January 2019 close to Paris, France and a workshop in April 2019 in Greece! inner peace project (temporary title): a movement and music installation and performance about inner peace. I aim to share a state of inner peace and silence with the audience, using movement, performance and music as a medium. The movement will be inspired by my own contemporary vocabulary and the little I know from kuchipudi and kalari. The performance will revolve around ritual objects that have a personal meaning and a video installation. The music will be traditional dhrupad singing with tanpura, one of the oldest forms of Hindustani classical music. This project will have different incarnations as gallery installations and stage performances. Tuiles à Frazé (temporary title): a site specific installation in the beautiful country side town of Frazé, France. It will take place in and around a building that was used to make roof tiles for the local village. Visual columns: a choreographed dance piece drawing inspiration from neuroscience. I will use seminal research on the visual cortex from the 1960s to devise movement and structures inspired from the experiments Hubel and Wiesel did on the visual cortex of cats. If all or some of these projects resonate with you, just talk to me! I am looking for support and collaborators.